As you all are well aware of, the feeling that you get when you train and you feel so powerful, indestructible that you could go on for hours doing plenty of repetitions and exercises, is something indescribable and that no one but you can get whenever you train. Especially if you are very strong minded and nothing/no one else can stop you from doing that one more set/rep, you know perfectly that this is like being a lion in a cage while the beef is waiting right outside. What I mean is that, in general, for all those who consider themselves in love with the sport they practice, it can really become like a drug and thanks god in most of the cases is a healthy one. But!!! But, you have also to stop for a second and think if, whenever you come across those millions of YouTube videos where guys from all over the world are showing you how strong and resistant they are, and wonder if it is really everything so easy for them and out of trouble. Well, after a while happens that by chance you come across a news saying that, that guy got a serious injury in his wrist, elbow, shoulder, back or whichever part of his body and because of such type of injuries cannot go on anymore. The result is then a long break from practice or, in worst of the cases, to quit. Few months ago, I came across an Instagram post that left me quite astonished as I found out that, one guy who was often mentioned in videos and social networks, as one of the best in planche and front lever, had to quit because a serious injury occurred in his shoulder. Now, if you watch the videos of this athlete, you could wonder how was he able to achieve such complex skills in what was seemed to be so easy for him, without getting any pain nor ache while training always to the maximum?! Well truth is that, probably this guy never approached in proper way a good stretching session in between his trainings (for years) considering that he had been training probably every day by pushing farther and farther his limits until that point that became his end instead of just another step forward. He was training in home and outdoor and whether you could see him on the ground, on a bar, on gymnastic rings or on parallettes, the easiest exercise he was doing was a manna, a viktorian or an iron cross on rings for instance. All these kind of very advanced exercises imply that those who are performing such exercises cannot think to be able to execute them in perfect form just and only because they are young and thanks to all the hours they spent on trying more and more repeatedly day and night. The body needs to rest and to recover from the stress you put on it, in every training; this is why the deload phase is very important to let the muscles, tendons and ligaments recover and be able to bear a new load with the next training. Consider also fact that, usually, it takes about 48 hours before muscles are fully recovered and ready for the next training. Now, keeping in mind what stated above, I wanna give you another case that kept particularly my attention. 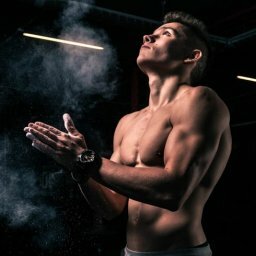 I came across another news regarding this time a very strong Street Workout athlete in his 25, who has been training since years ago mainly with additional weight to whichever exercise he was going to perform. This means that, almost every day, he has been training including weighted pull-ups, weighted dips, weighted push-ups, weighted squats and many more weighted exercises to his daily routines. All of a sudden, he needed to take a long break from training because by charging so much his tendons and ligaments with all the stress brought by the heavy weights he had used, reached the point that he tore his bicep and he also needed to go under surgery in order to recover. Well, even if he decided to make of Weighted Calisthenics his daily dose with which feeding his body, seems that the result didn’t end in the way he would have liked. Once again, I personally noticed that, whenever you start to add weight to your body when you decide to go more into weighted pull-ups or dips for instance, the weight affects the tendons and ligaments with a feeling of like “pulling” more than usual while only hanging on the bar with it around your waist. This is a clear example of how, if you listen to your body, you are able to recognize when there are different forces acting into your muscles. Not that weighted exercises are to avoid, since they represent a very effective way to increase the strength; they also help to perform in easier way other exercises in general, but they must be performed always with awareness of the dangers/limits that they bring. Another factor that has surely to be taken into account is the way you decide to set up your routines throughout the weeks/months. This means that, if you decide to train with a mesocycle method (explained in our previous articles), you will be mainly working on progressions. Since you must start from a base and then indeed progress towards harder versions of the exercises/skills throughout the months, also the overall load that you will put on your muscles/tendons/ligaments will increase. To make a clear example, if you have started with a 4×5 pull-ups and then you were able to make progress until reaching a 4×10, then you will consider to start to add some weight to your body in order to make it more stimulating for your muscles and mainly at a CNS level. In this way, by adding weight and start with a whole new say 4×3 weighted pull-ups with additional 10 kg, well tendons and ligaments will have work double in order to let you pull all the way up your body. This is ok, but you cannot then think to keep going by adding weight on weight without breaks. This is why, like I said in previous articles, in a mesocycle there is always at least a week of deload where you do not stop to train completely for a week, but simply you deload the reps (dynamic) and seconds (isometrics/eccentrics) of each exercise you included in your routines. It is not first time that I hear guys training every day, at least one hour and more without ever taking any break; well no matter the age you can have, I can assure you that since we are all human, a broken point can be reached. You must respect your body and since you really wanna take care of it in the best way with a good training that can bring you incredible satisfaction, you must also take care of the resting phase (which is essential). The message I wanna give you all here is that, no matter the age you can have, 15, 25, 35, always dedicate a part of your schedule to recover, to increase your mobility, your flexibility along your journey.